A small gem set in the Brenta Dolomites, Biohotel Hermitage awaits its guests at Madonna di Campiglio, one of the best-known ski resorts in Italy, which offers visitors the ever-changing colours of the mountains year-round. The Hotel is just 70 km from Trento and 150 km from Verona Airport. A fine superior 4-star hotel at Madonna di Campiglio, Biohotel Hermitage is a warm refuge set in fairy-tale surroundings, constructed in environment-friendly materials, based on the tenets of bio-architecture; fir and stone pine wood treated with bees’ wax, cork and local stone. The scent of wood, the soft caress of natural fabrics, the warm light filtering through large windows, all this forms part of the hotel’s 25 rooms, comforting hideaways offering guests regenerating rest, in close contact with the surrounding mountains. 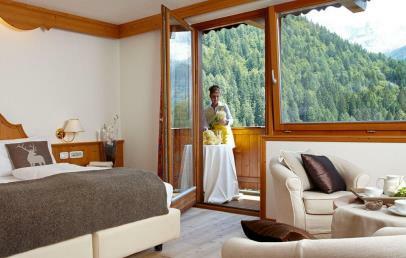 The Spa of Biohotel Hermitage is a welcoming oasis of relaxation, with its great windows opening on to the Dolomites. Set against a backdrop of unspoilt nature and the mountain silence, guests will be able to pass unforgettable moments of well-being, under the hands of trained professional staff offering a host of treatments: the hydro-massage pool, the mountain-herb sauna, the Turkish bath with oriental essences, massages and beauty treatments. The unspoilt natural scenery surrounding the Hotel is a lure for all nature, sports and active tourism lovers. Choose the winter months for skiing, snowboard and snowshoeing; choose the summer months to appreciate the thousand facets of the Dolomites: excursions on horseback, mountain bike, rafting, free-climbing, white-water thrills and hang-gliding. Once again, it’s the splendid backdrop of the Dolomites of Brenta which give an unforgettable sensory experience: the Hermitage Restaurant offers a medley of dishes based on local tradition, a stylish 4-course menu setting before you a selection of the area’s organic produce and the vegetables and herbs grown in the hotel’s own garden. If you’re in search of a magic blend between taste and romanticism, don’t miss the opportunity of dining at the Stube Hermitage, the first restaurant of Madonna di Campiglio to be awarded a star Michelin Star from 2008, an unforgettable culinary experience under the guide of Chef Giovanni D’Alitta. Hotel guests have free use of a private vehicle parking area and Wi-Fi connection throughout the premises. The price of your stay also includes: access to the Spa Hermitage, 24/7 concierge service, private minibus from 8 am to 8 pm, live music two or three times a week, gluten free and vegetarian menus. An instructor of the Italian Ski Academy is available every evening to organise lessons for the following day and provide info on the ski runs, snow condition and choice of equipment. A Nordic walking instructor is available every day to organise excursions. Payment of a supplement ensures the following services: garage (€ 10 per day), room service (€ 10 per call), laundry service, full board with à la carte lunch, the restaurant Stube Hermitage (booking necessary), Christmas Day and New Year’s dinner. Our Classic rooms are in fact very refined and elegant and offer a warm, cosy, mountain style atmosphere, ideal to finally rest and relax after an intense day of outdoor sports. Sit back and enjoy the cosiness of our Classic rooms where you will certainly live some unforgettable moments. Without view on the Dolomites of Brenta, some with balcony overlooking the courtyard, some with bioarchitecture design. Newly built rooms with bioarchitecture design, the majority with solid larch wood floors, and others fitted with pure virgin wool carpets. Furniture in spruce pine and Swiss stone pine wood, treated with linseed oil to keep the natural aroma intact. With balcony and view on the Dolomites of Brenta. 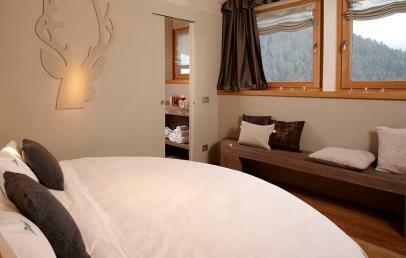 Our refined mountain style Junior Suite is a cosy setting where you will feel like at home. Newly built rooms with bioarchitecture design, the majority with solid larch/spruce pine wood floors, and others fitted with pure virgin wool carpets. Furniture in spruce pine wood, treated with linseed oil to keep the natural aroma intact. Lounge area. 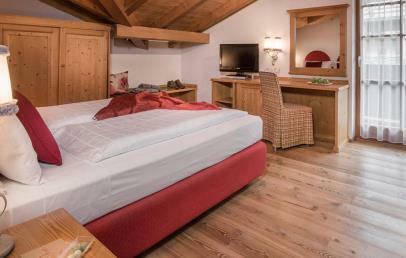 All attic rooms with view on the Dolomites of Brenta region. 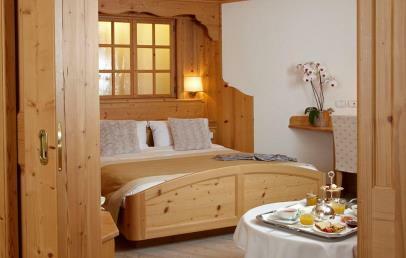 There is nothing better for a family than to stay in a Mini Suite in a mountain style chalet. The first room you enter is the Mini Suite’s living room so you will have the impression of being in a pretty little apartment. Sliding doors separate the bedroom from the living room. The Mini Suite has two bathrooms for maximum comfort. With balcony and view on the Dolomite. Newly built rooms with bioarchitecture design, our Stella Alpina rooms are the ideal location for your holiday: generously sized rooms, big bathrooms with a bath tub and a separate shower, a double wash basin built in red Verona marble, furniture in fir wood and a private balcony with a fantastic view over the Dolomites. Your family and you will fall in love with our mountain-chic style suite as soon as you step foot in it. This suite has been recently renovated resulting very elegant and even more particular thanks to the silver bark wall insert. 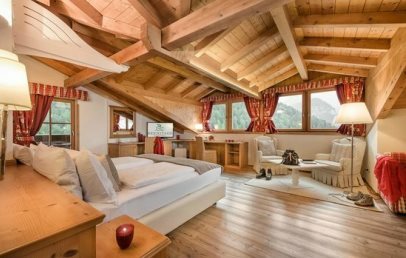 Located in the attic, it features private balcony with an amazing view of the Dolomites, natural wood floor, separated area for parental comfort and privacy and two bathrooms with shower.